I have seen a post from a year ago in this forum. But there is no much of developments in the forum. Has anybody come up with ways of implementing AR using TB then after? I would be happy to see if sb has implemented it. Do you mean specifically the methodology of Meier's book? Is there a better source than the 2010 book? Or are you interested in the problem more broadly? my experience has been that every company and every team has its own requirements for agile support. Tinderbox should make adaptation easy, but that means others' documents won't always work for you without some adjustment. Yes, I mean the book. Somebody asked about it http://www.eastgate.com/Tinderbox/forum//YaBB.cgi?num=1417421540/0; and you promised to develop some for us. But, the problem with direct application of their system is, it doesn't use the TimeLine capabilities of TB. 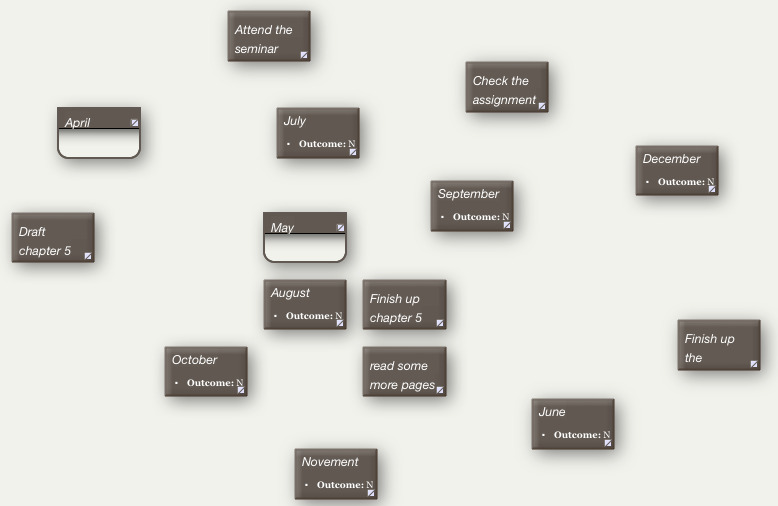 The other issue I am having is a contradiction between my roadmap of my project; and the timeline. should I structure my project on internal, Chapter, Section etc basis, or on time bases as the Agile system suggests? 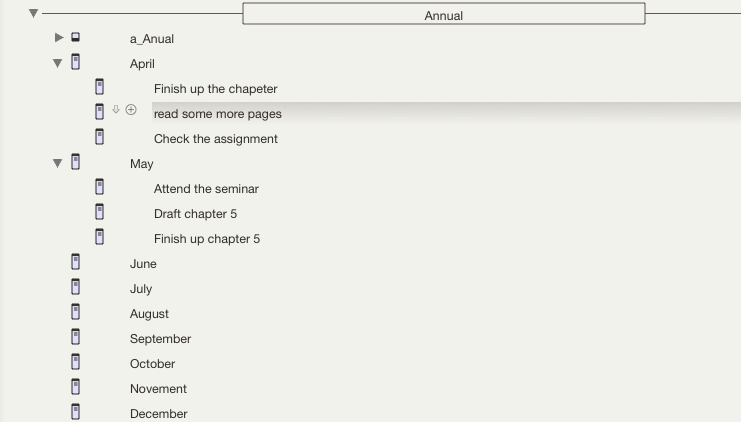 If I have to breakdown my big project (writing a dissertation) into small chunks so that they will fit to the monthly and weekly plans, what would be the best way to do it in TB (the timeboxing, time tracking , progress tracking etc)? I would be glad to here from sb with better experience with this system. Take their mind maps of the Annual Road map. At the heart of the Agile system is the ability to see the forest while still being in the Tree. In the mind maps, they are able to see nodes for each month, under the year; and Daily nodes under the Monthly nodes etc. They can see all at the same time. For TB, the containers are troublesome to glance the major areas (the Annual) for they intervene in the Map view. Shall I put all the Monthly, Weekly, Daily roadmaps inside the same container? (that will make good maps, but bad outlines), or keep them in separate containers? or, shall I completely give up the Outline for this case (I normally use the Outline view for reading and note taking--maps occasionally),and rely on Adornments to map the Roadmaps? (that means, I will keep all the Monthly, Weekly, Yearly roadmaps in the same container). The disadvantage of dropping all the notes into a container would be, Zooming in (focusing into) a specific Day/week would be impossible. We have only the Grand view; not the focused view in the maps. Don't overlook the (new to v6) Treemap view that gives you a 'map' of the outline. I another alternative would be to put the Months and Weaks in separate container; and using Agents to map the Grand view. The problem with the Agents is that they don't keep the relationship between the containers and their descendants. In the map view, collection of the Agent, there is no way to tell the Finish up chapter 5 is a child of May. Hi Mark; thanks for the suggestion.